For customers with an installed license, you will need to define the URL where the service resides in your environment. For customers with a hosted account by Integrify, you will need to define it as such: https://api5.integrify.com/servicessl/integrify-rest.svc. 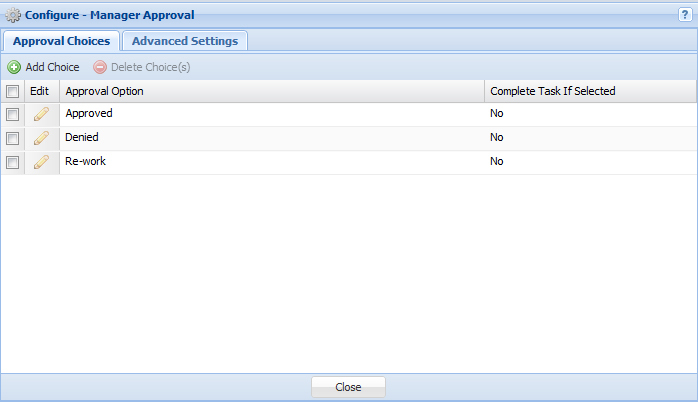 You will now need to insert the choices from your Approval Task into the email that goes to the recipients of the task. As shown above, select the Source from the Approval Task (Data) and then the Fields you want to insert into the email notification. For the HTML format, this will display the field names in the email for the recipient to select. Note: If you are using the TEXT format option, you will also need to type in the field labels next to the fields that you insert into this email notification so the recipient can see the field label in the email. You can customize the message for the landing page that appears once a user makes a selection for their approval task from within their email.